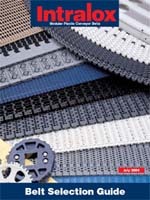 Intralox belts and chains are made of plastic modules. Belts are assembled in an interlocked, bricklayed pattern with full-length hinge rods – an inherently strong design. Intralox invented this technology in 1973 and has more experience in the design and application of modular plastic conveyor belts than any other company in the market.